Calling All Dawns is a song-cycle in three movements: day, night and dawn. Each movement corresponds to a different phase of life--life, death, and rebirth. There are songs of joy, mystery, and hardship, reflecting the complexity of our mortality. There are songs of the deepest, darkest sorrow to accompany us through death. And finally, there are songs of triumph and exultation that bring us roaring back to life, beginning the cycle anew. Each song flows seamlessly into the next, and the album ends on the same chord that it opens with--thereby representing the fluid, cyclical nature of the universe. It carries a strong message of unity: that regardless of race, culture and religious belief, we are all connected through our common human experience. Notable guest artists include Soweto Gospel Choir, Frederica von Stade, Anonymous 4, Dulce Pontes, Lia, Aoi Tada, Kaori Omura, Jia Ruhan, Roopa Mahadevan, Jerome Kavanagh, On Ensemble and the Royal Philharmonic Orchestra (conducted by Lucas Richman). Calling All Dawns has been performed at Carnegie Hall, the Lincoln Center, Cadogan Hall, and in many other venues around the world. The opening movement, ‘Baba Yetu’ has become a modern choral standard, and has received additional performances at Disney Concert Hall, the Kennedy Center, the UN General Assembly Hall and in thousands of amateur concerts internationally. Baba Yetu was originally composed as the theme song for the award-winning video game Civilization IV. It quickly took on a life of its own outside of the game, however, first winning two Game Audio Network Guild awards for video game music, and then becoming one of the most popular and frequently performed pieces of video game music ever written. It became a fixture of the Video Games Live touring concert series, receiving performances at the Hollywood Bowl, Kennedy Center, Royal Festival Hall, and many other concert venues. Likewise, it has received hundreds of amateur performances by high school and community choirs. The sheet music was released by Alfred Publishing, and quickly became one of their best selling choral octavos. It was also used in the opening ceremonies of the World Games of 2009 in Kaohsiung, Taiwan, and as a featured segment in the choreographed Dubai Fountain, the world's largest interactive water feature. Missionaries of the 19th-century used Swahili as the lingua franca for spreading Christianity across East Africa; consequently, a rich tradition of vocal music arose that blended European harmonies with traditional African call-and-response. Baba Yetu iterally means 'Our Father,' and is a Swahili translation of The Lord's Prayer. It serves as an overture to Calling All Dawns, blending African choral music with Western symphonic structure, thus beginning our journey of humanity from the cradle of civilization. Within every traditional Japanese haiku is a 'kigo'--a word associating the poem with a particular season. Mado Kara Mieru is an adaptation of five such haiku in rondo form; corresponding to spring, summer, autumn, winter and the return of spring. Each refrain is sung by a vocalist in a different stage of life--a child for s pring, a young woman for summer, a middle-aged man for autumn, and an elderly man for winter. Following an extended instrumental 'transfiguration,' the return of the child 's voice at the end signifies the return of spring, thus completing the cycle of life, death and rebirth as reflected through the changing of the seasons. The core text of Daoism is the Dao De Jing: a compendium of universal truths concealed behind a famously cryptic maze of contradictions. Among the themes contained within is the notion of return, exemplified in Chapter 40. Dao Zai Fan Ye translates as 'The Path Is In Returning,' and is a meditation on both the cyclical nature of the universe, as well as the acceptance of its inexorability; indeed, it states that everything in the universe is born from the cycle of life and death. ruo zhe dao zhi yong. Are born of being, are born of non-being/death. The first chapter of Calling All Dawns ends with two original lyrics about the sunset of ones life, presenting two opposing attitudes towards death. The first, Se É Pra Vir Que Venha, is a statement of courage and acceptance; knowing that the end is near, the narrator greets her fate with resignation and peace-- and though she is uncertain of her final destination, she goes gently into the night, carried off by the footsteps of a distant orchestral samba batucada. The second of two original lyrics, Rassemblons-Nous has dual meanings. On one hand it gives voice to the French tradition of revolution--indeed, it is inspired both by the 1789 French Revolution, as well as the 2005 riots of the poor ethnic minorities in the Parisian suburbs. But its greater meaning is that it abstracts these struggles into a song about a metaphysical revolution, where men and women march against the darkness of death. Though fate is inevitable, they still resist it; one by one they join in the struggle, and rather than going gently (as in Se É Pra Vir Que Venha), they choose to rage against the coming of the night. The Requiem Mass is a liturgical service of the Roman Catholic Church, conducted as a prayer for the salvation of the souls of the recently departed. As with all masses, it alternates between sacred readings and musical offerings, the last of which is the Communion. It is during this offering that the Lux Aeterna is sung, accompanying the sacrament of the Eucharist--the symbolic offering of bread and wine in remembrance of the Last Supper of Jesus, the night before his death and ultimate rebirth. Written in the 18th century, the Caoineadh Airt Uí Laoghaire is one of the most famous examples of a traditional Irish 'keen'--or song of wailing--performed by a widow over the deathbed of her husband. Black Haired Eileen's husband was slain by an Englishman who demanded that he sell him his horse; when he refused, he was gunned down. Eileen immortalized her grief in this epic poem, and to date it stands as one of the most poignant works of grief and loss. In this excerpt, she desperately implores her husband to return to life. mar a n-umhlóidh romhat mná is fir... My friend and my heart's love! "Hymn to the Holy Trinity"
Throughout its history, Poland has suffered countless wars that have repeatedly threatened its existence; through these dark periods of foreign occupation, it is only through faith, deeply rooted in Catholicism, that Polish culture has survived. The Hymn do Trójcy Świętej is an embodiment of that faith; a reminder that, with each dawn, the return of light brings with it an indescribable spiritual salvation that banishes even the darkest night. with the Saints in heaven adored. Eternal Glory, always and forever. The text of Hayom Kadosh is taken from the Book Of Nehemiah, from the Hebrew Bible; it recounts the rebuilding of the walls of Jerusalem--a metaphor for overcoming obstacles, and the re-emergence of hope. Likewise Hayom Kadosh emerges softly from the darkness, like a lullaby sung to a newborn. And as the prelude to the third and final chapter of Calling All Dawns, it summons the themes of the earlier songs and weaves them together in a musical tapestry. Do not mourn and do not weep. Omar Khayyam was an 11th-century Persian poet, philosopher, and mathematician, whose collected quatrains are known as the Rubaiyat of Omar Khayyam. Despite a strong Islamic background, Omar Khayyam was in fact a religious skeptic--therefore his writings were often infused with mysticism, and advocated the enjoyment of earthly delights in the face of mortality. The refrain 'Hamsáfár' means 'journey together,' and is a rallying call to all people--and like the earlier song Se É Pra Vir Que Venha (which shares common musical motifs), the song emphasizes the contentment to be found in living in the present. We are mere ghosts, revolving, the flame surround. The Bhagavad Gita is one of the sacred texts of Hinduism, and is a dialogue between Prince Arjuna and Krishna, the Divine One. In the excerpt used for Sukla-Krsne, Krishna explains to the prince that there are two paths to the afterlife; 1) a death by day, which leads to the supreme abode, and 2) a death by night, which leads to an earthly return. But rather than dwell on the time and place of passing, he advises Arjuna to fix his devotion on the Krishna consciousness, and to detach himself from material concerns; and in doing so, his place among the supreme will be assured. 'Sukla-Krsne' means 'Light and Darkness'--a duality which serves as a basis for the constantly shifting moods of the song. know the Supreme shall attain the Supreme. Kia Hora Te Marino is a setting of a traditional Maori blessing, used as a benediction to conclude Calling All Dawns. While the opening wordless chorus is evocative of the maritime imagery found in much Maori writing, the song also makes use of two traditional forms of oratory: the haka, a ritualistic choreographed group dance, and the whaikorero, a form of speechmaking used to unite the collective will of the people. With unified purpose, the song drives towards a climactic finish, and ends on the same chord that Baba Yetu fades in on, thereby returning to the beginning of the cycle. ka wairara, ka hinga. Said of human life. The sun rises to the zenith, then declines. He aha te mea nui i te ao? (All) the people, the people, the people! humie e hui e taiki e! The first breath we take. and bring it into force like the axe. Gather, gather and go forward! 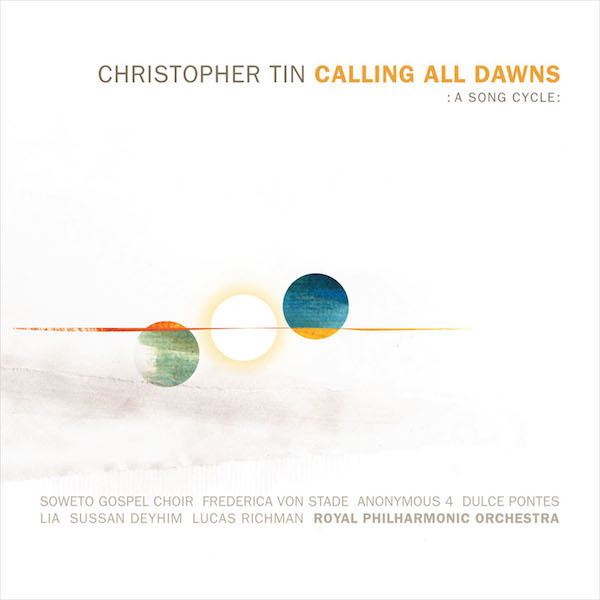 Christopher Tin's album is a masterpiece. Every track is of such a high calibre and standard... "Calling All Dawns" is not just the best world music album of 2009, it's one of the best world music albums of the decade. Pure and absolute musical hedonism. I opened it up and listened--something I rarely do quickly with new CDs. After hearing just the first track, I took it home to play for my wife, because I thought she would be blown away by it. I cannot explain why, but parts of it nearly had me in tears. This is really great stuff. With superior vocals, Calling All Dawns is a refreshing & exciting juxtaposing of one of the finest orchestras in the world with a new spin on traditional ideas. A definite recommendation to anyone looking to enjoy & expand their classical view of world music.